Welcome back to our Game of the Month series! Each month we will feature one of our favorite games, give you a general idea of the game play and how we use it for homeschooling. These will always be games that we love and play often. 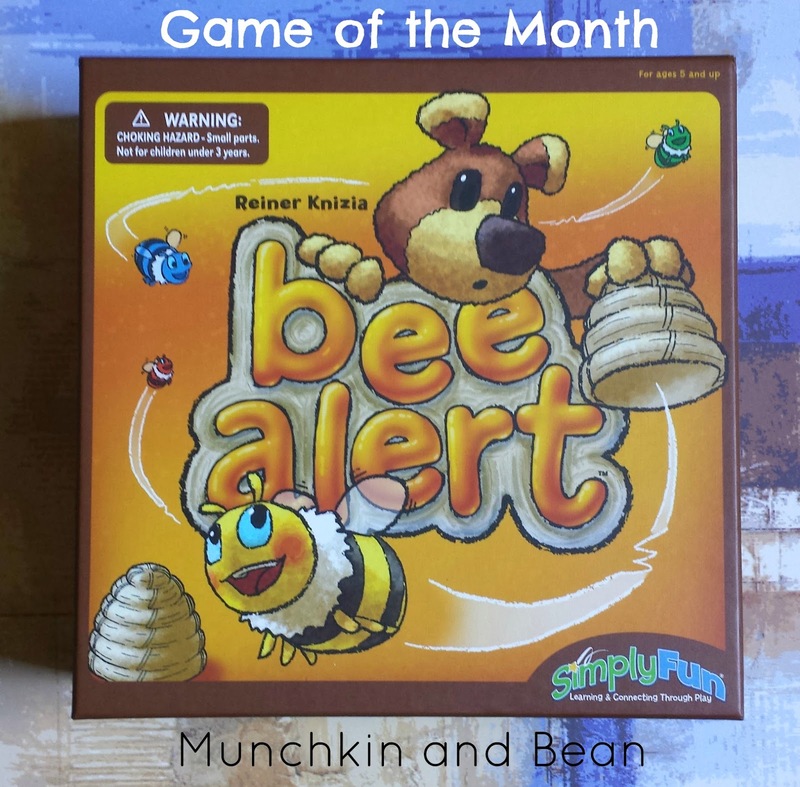 We featured Ani-gram-it last month, and this month we are featuring Bee Alert! 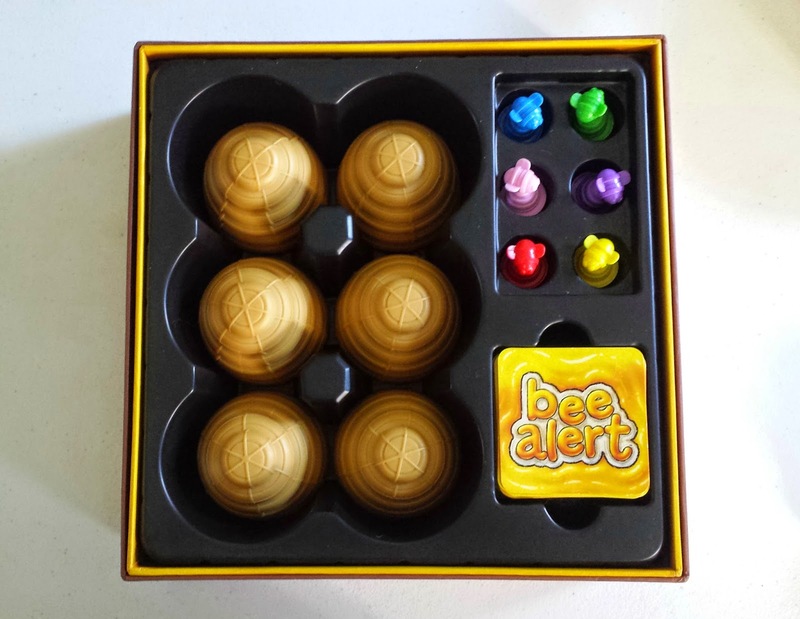 Bee Alert was created by Reiner Knizia for Simply Fun. 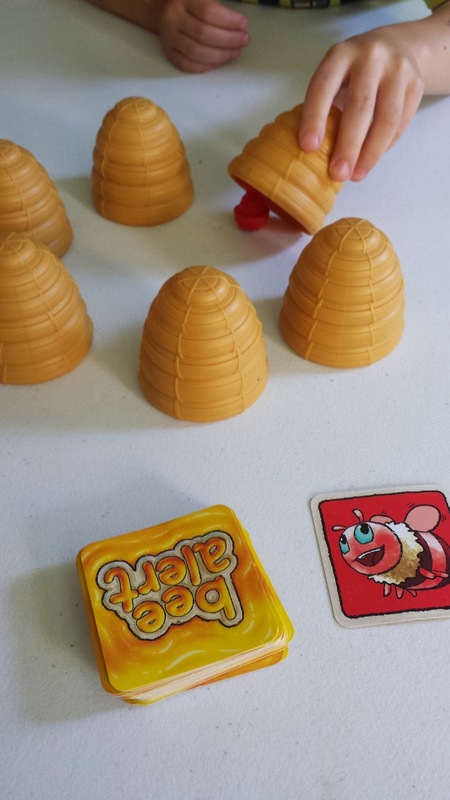 Bee Alert is intended for children ages 5 and up, however my children began playing this game when they were 2 and 3 and had no issues with it. Please use your best judgement when letting a toddler play games with you, as there may be some small parts. 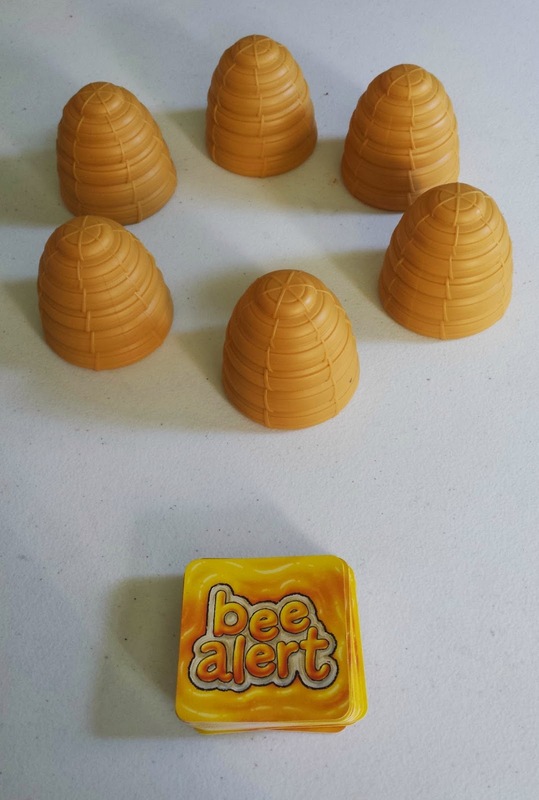 Bee Alert can be played by 2-5 players and each round lasts an average of 15-20 minutes. The game includes 36 cards, six beehives and six bees. Bee Alert focuses on memory and observation skills, focus and attention skills, fine motor skills and learning to be patient while taking turns. That last skill did take some time getting used to, but this was a great game to practice taking turns and learning to be patient while other players took their turns. My own children are fairly cooperative, and it may help that we play games often. Everything stores neatly inside the box, which makes clean up quiet and easy! There is also a thin directions paper that fits on top. Set up the bees in a circle and then place a beehive over them. You definitely want younger children to see the bees before you place the beehives over them. Have your child watch you set up and tell them they need to "be alert" and remember where each bee is. Shuffle the cards and set them up beside the beehives. I typically place them near me, or another parent, who will flip the cards on each players turn. The player who ate honey last begins, then proceed clockwise. On your turn you'll flip a card to reveal a colorful bee, bear or beehive. All revealed cards will be placed face up in a discard pile. If your card has a bee on it, you have to "be alert" and remember where that colored bee is. Lift up the beehive you think that bee is under. If you are correct, move the beehive in front of you. If you are wrong, place the beehive back over the bee. Keep all bees covered up, because if someone draws a bee card and that bee is in front of you, they can guess it and then move it in front of them. - If you choose a bee in front of you and get it correct, you can immediately take another turn. 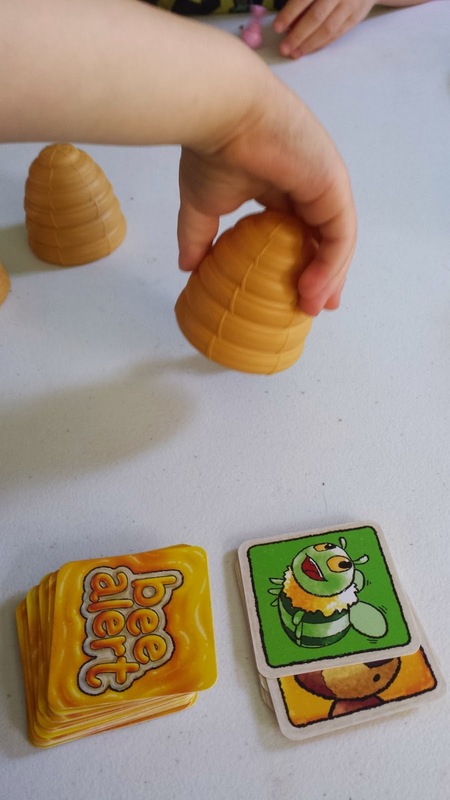 If your card has the beehive on it, select any beehive from the middle of the table and place it in front of you, but you do not have to lift it to reveal the bee underneath it. If there are no beehives in the middle of the table, you can take a beehive from in front of another player. If your card has a bear on it, you loose a beehive! Push one of the beehives in front of you back into the middle of the table, but you do not have to reveal the bee beneath it. If you have no beehives, pass to the next player. 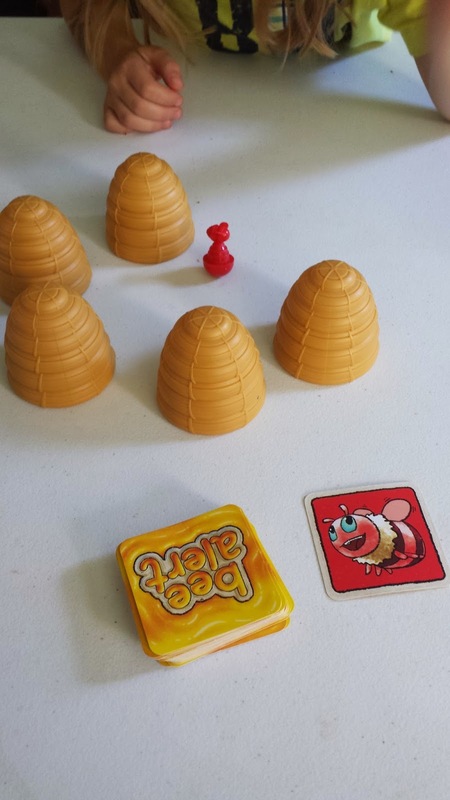 Play clockwise until one player has four beehives in front of them. Otherwise play to the end of the deck of cards and the winner is the player with the most beehives. If there is a tie, shuffle the deck and those two players will play until someone scores. Then they are the winner! You want to remember not to shuffle any beehives during the game. The purpose of the game is to have them remember where the beehives are, not to guess where they are. My daughter likes to check first, and when she is right (which she usually is), she announces she got it right really loudly. She also doesn't try to hide her bee color. My son on the other hand likes to peek under the beehive. We love Bee Alert. We literally play nearly every day, if not several times a day. While their memory skills were really great before, I think this game has done a wonderful job to teach them to concentrate and remember where things are. They do very well with matching games now. If I know we will be learning something that requires focus and attention to detail, we will play this game before starting that activity. It has worked wonderfully for us!